1. Where do the Cairn Terrier dogs come from? It is one of the oldest working breeds of Scottish terrier originating from the mountainous regions of the north west coast of Scotland and the islands. Its name comes from vertically arranged stone stacks - "Cairn" meaning ancient Scottish burial or remembrance; in them they liked to hide such pests as foxes, rats, rabbits, etc. The first mention of this breed (from the sixteenth century), they talk about using it by shepherds, farmers and hunters just to eliminate these pests. This race, however, evolved in the eighteenth and nineteenth centuries, when hunting became a sport, it was favored to hunt for badgers and otters. They were good players in such hunting because they could easily ignore the pain while catching the prey for a long time. As far as the appearance is concerned, until the beginning of the 20th century, cairn dogs looked similar but differed significantly in size, shape and color, depending on the area where they worked in the pack and the prey they hunted for. The breed was officially accepted by the UK Breeders Club in 1910. It is one of four distinct breeds from a wide range of terriers: Cairn, Skye, Scottish and West Highland White. The race to Poland was brought and distributed by Magdalena Świętoń - an international kennel judge. 2. What character traits do these dogs have? Although dogs of this breed are not currently used for hunting, they are still characterized by extraordinary courage, perseverance and intelligence. Currently, the Cairn Terrier excels as a reasonable, eternally smiling family companion. He is interesting, he quickly learn tricks and dog commands. Just like every terrier is a trustee with a touch of independence. Cairns are vigilant but in the unobtrusive sense of the word: they actively love children, they are patient in noisy environments, they have a phantastic sense of humor and can express their mood by issuing various sounds. For grandma and grandpa is small enough to be cuddled, for children it is strong enough to buzz on the lawn, for a man brave enough and solid in the walk, and for a woman is the everyday spark of pugnacious love. 3. 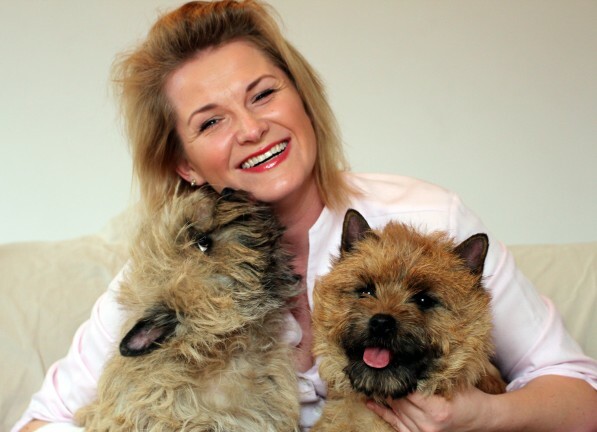 How to look after a cairn terrier to take into account his needs and temperament? Cairns need a loving, reliable, delicate and at the same time consistent hand, because they can be stubborn. It is not a "leash" race, if we drop it in the forest, it can instinctively run after the interesting scent of the prey. They like active trips to the forest or water, jogging, but also quiet walks, which even in the worst weather conditions give them a lot of joy. Blowing rain or refreshing frost is not terrible for them. Cairnymożna learned from a small acceptance of a cat or other pet. In short, home pets will be a "cairna" family. Nevertheless, the animals of the neighbors will be their prey just like: moles, rats, mice, rabbits, ferrets that will run into the area inadvertently. 4. What is the formula and mission of Edeus kennel? We treat Cairns as members of our family, while little ones who come into the world in our home are brought up with love for the families who will later be their longtime companions. We place great emphasis on proper socialization, consistent temperament, mental and physical health of our puppies. Families who choose a crescent need to be sure of their needs and expectations, and the time needed to take a lifetime decision can never be limited. At the same time, I am constantly striving to make every next generation equally beautiful - better in quality, so that every family would be proud of having a Cairn Terrier from Breeding Edeus FCI.